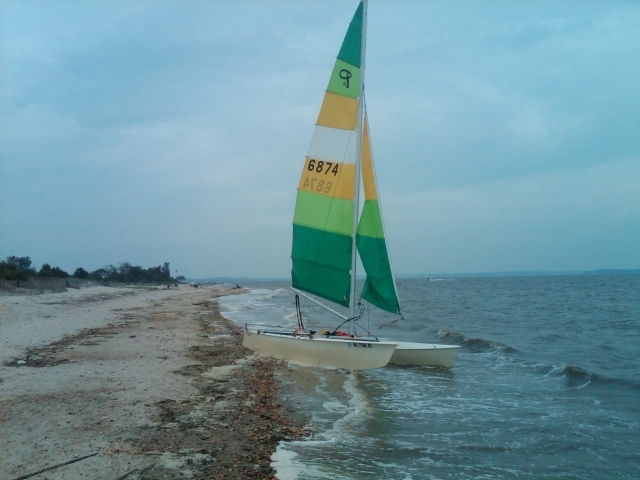 Continue reading "Telescopic Trailer Tongue to keep your car out of the ocean"
I had a nice and leisurely time sailing straight downwind all the way to the bridge. The journey was about 15 miles and took under two hours. I knew that coming back would be harder, but figured that I should not be so conservative all the time and live a little. In about an hour and a half I found myself approaching land which was strangely familiar, and yet entirely devoid of that "home port" feeling. This familiar land was Leonardo. I felt that this was acceptable as tacking goes, and I'd tack back towards Staten Island next, but when I turned and tried to settle into a similarly acceptable course on the port tack, I found myself heading almost exactly for the Verazzano Bridge. This was somewhat disheartening, so I beached the craft just west of Leonardo and had lunch on a beach that was still somewhat warm. Several more attempts at getting somewhere resulted in the same success rate, and thus I felt it time to play the remaining ace I had in reserve. I beached the craft yet again, in almost the same spot (as I literally gained no ground against the wind), and reefed the sail. Reefing the sail is basically leaving it part-way down, and mine has the fittings to permit this to be done given adequate spare line, which I happened to have. What this means is that now I have a boat with a dragging rudder and excessive sail area, in other words, it requires all of my upper body strength (of which I do have a fair amount) to steer. At this point, I had no choice but to admit defeat - which, naturally, does not excuse me from further failures. I went back to the beach yet again and asked for help. Now, I don't usually do this.... I don't mind asking for directions (who does that nowadays, anyway? ), but asking for help with stuff like this is typically met with the following response from my inner rationalizer: "And if this easy way out weren't available, what would you do, huh? You're supposed to be self-sufficient!". Yet my situation was clear: It took me an hour to go 500 feet. I have 10 miles to go, all up wind. It is past 5pm, and sunset is in less than 2 hours. So I picked up the phone and asked my wife to come pick me up at a downwind marina. Now, doing this would require that my truck and trailer also find their way to this new marina - which would require some commuting, but it was better than my current situation. It's been two days, and my muscles are still quite sore. I feel that the sailing season is over for me this year. Maybe I'll take a class next year. 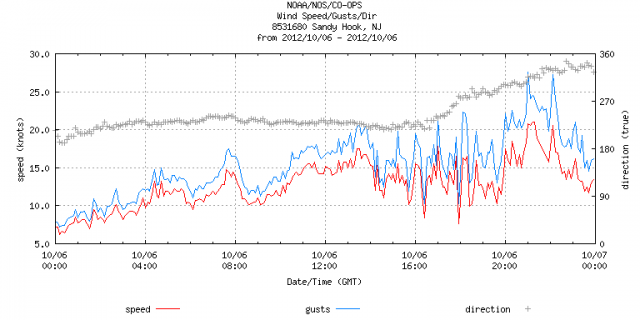 According to this, if I had stayed out a bit longer I could have sailed back - the wind shifted from West to North. One of the things that makes me reluctant to take my boat out is the time it takes to rig it. I am generally sailing alone, and am thus rigging it alone as well. Fully rigging it takes me nearly an hour. I've read a bit about what can be done to make the process quicker, and am now going through the options. Some changes are obvious winners, and I upgraded some hardware to quick release. To figure out what's worth doing, I needed to analyse the process to find bottlenecks. To do this, I left a camera running while I rigged my boat alone. 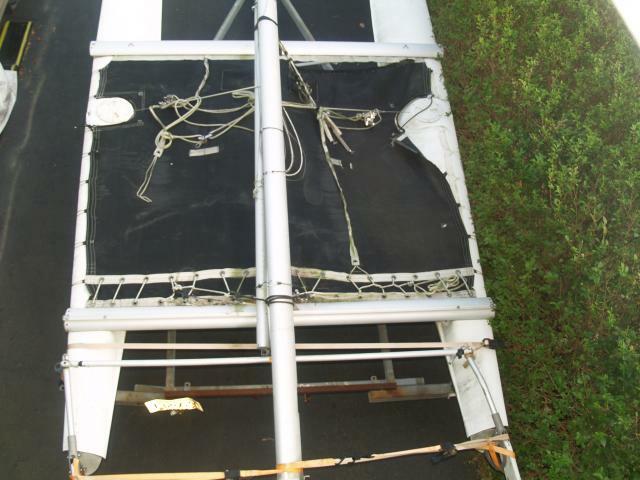 This leaves only raising the main sail (which is best done at the water on windy days) and of course getting off the trailer and parking the truck - perhaps another 10 minutes. So I've thus far dropped my 1 hour to less than 40 minutes. I was expecting the rudders to be the biggest single component, but at 3 minutes, it's probably not worth it to attempt to rig something to permit them to stay on the boat. Raising the Jib took longer because I had to find a substitute zipper runner (my zipper is torn, I lost the runner, and the new runner isn't running as smoothly... I removed 14 minutes of looking for a donor with a suitable zipper). Raising and tensioning the main is therefore probably the largest segment, but it couldn't be captured. Leaving the mainsheet blocks attached at both ends appears to be helpful. The whole boat on trailer backwards business would likely gain me at most 3:30 (Shrouds could stay attached, and mast positioning would be reduced), so probably not worth the trouble. Continue reading "Prindle Quick-Release forestay modifications"
I've now owned a sailboat for about 2 months. In this time I learned some sailing terms, some sailing maneuvers, and a lot of sailing frustration. 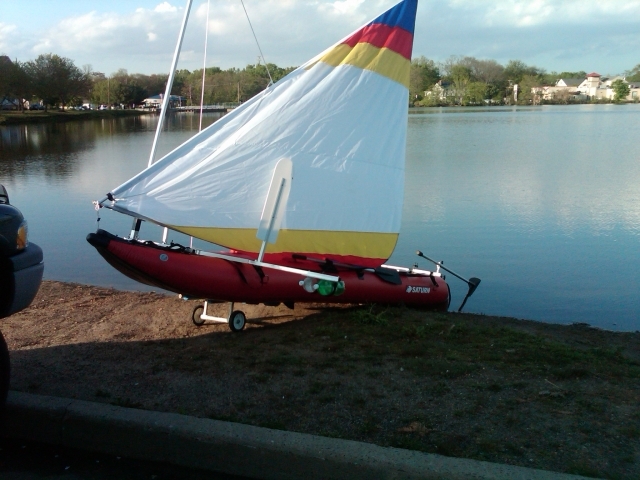 My first boat is a Kaboat 14 with a removable sailkit from SailBoatsToGo.com. It's the deluxe version, bigger sail, bigger leeboards. I have to be honest - this thing does sail. 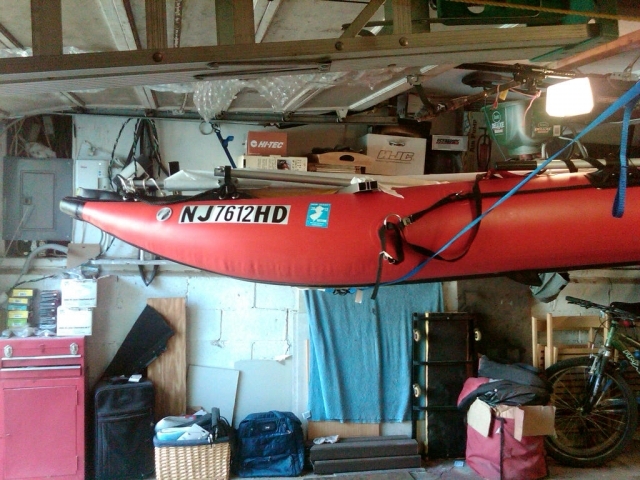 And it does pack into bags, which is the main reason I bought it - so I can tow my RV and bring a boat. It takes about 30 minutes to put together, which I find to be fairly reasonable. It only sails well downwind. It can't really point - I'm not sure if that's because it's a raft, or because the sail doesn't let it, or because I lack the skills to make it do so. But the end result is a 170 degree no-sail zone. In other words, if you go downwind, you can't really come back - instead, you tack, then you tack, and each time you lose all the ground you gained. This setup lacks blocks and cleats - so you have to hold the mainsheet at all times. My arm gets tired. In short, it's not ideal. The last time I was out on Lake Hopatcong I was making my slow and wakeful way back to port, surrounded by heeling HobieCat's. The catamarans were flying around me in circles, seemingly unaware that the winds were mild and suboptimal. It took about 2 weeks for me to start considering an upgrade seriously... and the search for the perfect catamaran began. I planned this well in advance, at least 2 months. The park seemed perfect for what I had in mind: quiet, not popular with kids, waterfront, water. Besides, I figured that it would be a welcome reprieve from the hot summer weather in new jersey. The waterfront campsites have no hookups at all, so I got ready to "rough it" by buying a cheap Harbor Freight generator to supplement my solar array on cloudy days. Even with this much of an advance notice my site options were limited at best. Of course I wanted waterfront... But I managed to reserve site number 47 which looked good on paper and on google maps satellite. Things have not quite worked out as I expected. Sites 30-50 are classified as prime waterfront, while other sites are either just prime, or I suppose, subprime. Our site turned out to indeed be waterfront, but I'm not sure if I would qualify it as prime. While it fit the 20 foot trailer (barely), and it is right by the water, you don't actually see this water unless you can get around the hedges that line most of the water edge. I guess this is really a subprime waterfront site. Frankly, many of the other prime waterfront sites are not much better, and most offer the same limited view. There are a few perfect looking sites here, specifically 42 through 30. If I were to come back here, that is where I'd stay - except that most of these have significant tree cover and would render my solar panels useless. Even in our site we only got sun until about 3pm - and the nearby sites are worse. 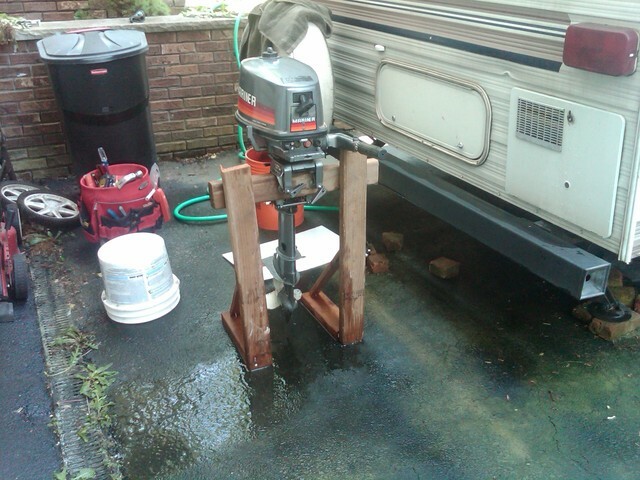 None of the waterfront sites have electric hookups, so any RVs that stay there run generators (except ours). The good news is that you really are about 20 feet from the water and it is possible to launch small watercraft directly from the site, which is exactly what I would have been doing upon arrival if it were not raining and cold! I certainly did not expect mid 60's for the high in late June. Launching is somewhat challenging because of the rocks, so foot protection is highly recommended. Fortunately, the next day was slightly warmer and was occasionally rain-free, so I seized the opportunity to take out the sail boat - something I continued to do every day until we left. The weather gradually got warmer and warmer, and it didn't rain again. Continue reading "Lake Ontario - Long Point State Park"
My first brilliant solution to the boat numbering problem was of course using the self-stick numbers from Home Depot. These did stick to the inflatable PVC hull, but inspired no confidence as the corners peeled off immediately. After some research, I figured that I need to paint the numbers on. I ordered stencils, made a template with stencils, tape and old newspapers, and sprayed white Krylon Fusion onto the boat. This is a surprisingly time-consuming process - making the template to look straight in the first place can take a while, then masking and taping, and more masking.... and in the end, you still wind up with overspray everywhere because the letters weren't absolutely flush with the boat. Now you need to use acetone to clean up the cloudy edges, which also takes forever and goes through paper towels very quickly. The real surprise comes in a few days - when you realize that the paint isn't drying. It's still sticky - scotch tape sticky. So I called Krylon, and they confirmed that the paint will only work on rigid PVC. Thanks, Krylon, all of my spray paint works on rigid PVC. At this point there is nothing else left to try but that which you should have spent your money on in the first place - boatnumberplate.com .... live and learn. 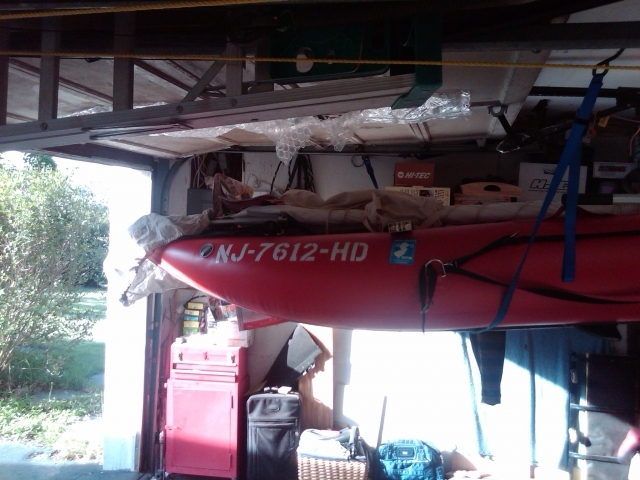 Continue reading "The challenges of numbering an inflatable boat"
Boat over 12' long? Then register it and take the course. Plan to put a motor on it? Then register it and take the course. I found a locally taught $75 course from Boat Safe US, and it turned out not to be a complete waste of time (other than saving me $500 in fines should I ever get checked). While I already knew or inferred a great deal of the material, the unambiguous driving rules and various other bits of info were helpful. Our instructor was coaching us for the entire 8 hours to pass the test - he basically gave away all the exam questions, so it was hardly a surprise that most people got a perfect score. Now I can legally drive just about anything that isn't commercially registered - a 60' yacht if I wanted to. But that isn't what I'm driving. I'm driving an inflatable raft. Fortunately, that's also legal. After our Sinking in the Navesink adventure which is covered in an earlier entry, me and my passenger reached a spontaneous and hesitation-free decision. Something about rowing a sagging craft a midst a cloud of gnats makes one wish for a backup plan, and this plan involves powered propulsion, and by powered I don't mean human-powered. It took some pondering to decide whether I wanted electricity or gasoline as my main power source, but ultimately gas won due to the particular appeal of exhaust fumes, noise, and the inability to use it in restricted waters. Or was it the range? I suppose it must have been the range. Doubling your range with electric means another 50lb+ battery which costs another $170+, and will probably last a few years before it wears out. Doubling the range with gas means a couple of pounds of gasoline in a little red plastic container. My wife took care of blacklisting the no-name category altogether, based on some interesting past experiences. I don't have a problem with off-brands, but try as I might I couldn't find a source of replacement parts for any brands I considered, so to her surprise I came to agree with her opinion. Most forum discussions seem to agree here as well (often for unscientific reasons like "Buy American"), and while I often get a bit concerned when too many people agree with me, I felt that the decision was justified regardless of motives. The choice between the remaining categories was simple. I felt that spending $1400 on a new motor was a bit excessive, seeing as how the whole boat thus far has cost about that much. As for used, June is not the ideal time for shopping - supply is running out, demand is high, and unsurprisingly the prices go up. Fortunately outboards hold their value remarkably well and thus I can probably get my money back. After some craigslist hunting I found the perfect motor: A Mariner 4M 2 stroke. The boat can take a 10 hp 2 stroke but I don't want to carry anywhere near that much weight. The little Mariners seem to be very well liked, and after a bit of failed negotiating I had it for a spring-time price of $375. It ran great but showed signs of poor cooling flow, and so of course I wound up pulling it apart. Continue reading "A registered rubber ducky"
The clouds were rolling in steadily, and their distorted reflections now danced inquisitively in the dark stillness of the water. I continued to row, moving my eyes periodically from the luffing sail above my head to the shriveled and distorted shape of the boat hull, as it gave way to the force I applied to the oarlocks and then returned to its proper form, as if I were pumping some huge red bellows for some distant furnace. My destination, formerly my point of origin, continued to loom in the distance behind me, reminding me each time I turned my head of just how fast 2 miles per hour really is. Looking aft I would encounter the compassionate stare of my wife, helpless in her desire to assist me in some way, but finding no help from either the entirely absent wind or the partially broken rear oar locks. I was grateful, for the moment, for the sudden disappearance of trumpeting power boats passing us on either side. Each pass of these vessels added insult to helplessness in the form of a limp sail flapping back and forth as we bobbed in their powerful wake. Now even these sources of noise and unrest were gone and all that disturbed our slow progress back to shore were the gnats, silently landing on us in small but appreciable quantities. Every few oar strokes I would break my rhythm to inform the gnats of how I truly feel about them. Continue reading "Sailing Adventure #5: Sinking in the Navesink"
Continue reading "Sailing Adventure #4: Ocean and Navesink River"